I was out tonight as I needed to pick up a copy of a book written by the guest we're featuring this week on The Hockey Show. Normally, this is a very simple process. 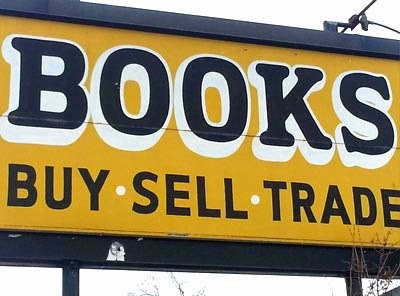 I walk into my local bookstore, I locate a copy of the book I'd like, and I head to the cash register where the exchange of money for those goods happens. Everyone smiles, we part ways on happy terms, and the world keeps spinning upon its axis. Last night, I deviated from my normal bookstore visit as I needed to do some shopping, ending up at a place of crying babies and aisles filled with products. I won't mention the name of this store, but I sWALlowed my pride and when I should have been sMART. See what I did there? Anyway, I located said book at said store, and I found it had one of those distinctive "40% off cover price" stickers on it. Bonus, right? Being the last copy of the book I can find in the store, I am relieved! The cover price showed $19.95, so I figured I'd save about $8 on this purchase. My night became suddenly better with this added discount, so I collected the book and the other things I was wanting to purchase and headed off to the squeeze chute known as the checkout line. I eventually made it to a cash register where an associate casually swiped my items over the scanning laser. When she swiped the book, the price came up as $19.95. Needless to say, I stopped the assembly line right there as there was a bit of a problem with the laser's reading of that barcode. Teebz: "Excuse me, but did that book swipe at $19.95?" Associate: "Let me check." She prints up some receipt paper. "Why, yes it did." T: "The sticker says 40% off the cover price." T: "But the cover price is $19.95." T: "So where's the 40% off?" A: "It's already factored into the price that it swipes at." T: "That's impossible if the cover price is $19.95." A: "Well, it's programmed in." If you know me, I'm sure that you already know I'm getting a little annoyed with this associate. T: "But the sale price can't be $19.95 if the sticker says it's 40% off the cover price. That's why they put the prices on the cover. It IS the cover price." A: "It's all programmed in." T: "Then the program is wrong." A: "Look, do you want the book?" So now I'm an inconvenience because I questioned the all-knowing, all-seeing laser barcode scanner? Look, it's not my fault that you can't grasp the concept of what a cover price is. And yes, I still want the damned book! A: "Then pay for it and take your receipt to customer service. They can look into this for you if you believe it's wrong." "Believe it's wrong"? Lady, are you trying to get a punch in the face? But I keep my mouth shut, my fists unclenched, and I pay for the overpriced book and my other assortment of stuff. She tosses everything into a plastic bag and hands me the receipt while saying, "Have a good night, sir." The smugness on her face nearly had me drop the mitts and jersey her in that idiotic blue vest, but I had more pressing matters of principle upon which to wage war. As I filed into the second squeeze chute known as the "Customer Service Line", I realized the glaring oxymoron of the term "customer service" when you're a customer at this store. There was all sorts of merchandise strewn about the counter, hanging out of cabinet doors, and piled high behind the one customer service associate at the Customer Service counter. Needless to say, it felt like an episode of Hoarders rather than a place of happy returns. Teebz: Hi, I just bought this book, and I noticed that there is a 40% off sticker on the front, yet it rung through at full price." I present my evidence in the form of my receipt and the book to the customer service associate. This young lady, who appeared to be a high school student, would be my judge, jury, and executioner in this negotiation. Customer Service Associate: "Sure, let me have a look." So far, so good. T: "If you notice, the cover price says $19.95, and the price it was rung through at was $19.95, so I was wondering where the 40% off came in." CSA: "Um, I'm not sure. Let me call the department." This is progress. She makes a phone call. See, here's the thing about that phone call, though. She called, she announced to call her at 1-5-0 across the store public address system, and then she walks to the back office. The phone rings. Again. And again. And again. She's chatting with someone in the office while I stand at her counter listening to the phone ring while staring daggers at her. Again, she's probably a high school student so maybe things like customer service aren't her strength just yet, but I'm pretty sure she understands the concept of how phones work. After all, she's a teenager. The phone stops ringing. After a few additional minutes, she returns. She again calls the department. This time, though, they are ready for her as the phone rings immediately upon her putting the phone back into its cradle. She and the person on the other end of the line - it could have been anyone in the store at this point: janitor, customer, McDonald's employee, whoever - had a discussion that probably led nowhere since she seemed no better off once she hung up the phone. I suspect it may have been because I had the last copy in the store at the Customer Service desk meaning that the other associate couldn't find a copy, but I wasn't privy to the phone conversation. CSA: "Excuse me a moment." She takes the book over to another associate working behind the counter. They have a secretive chat about the book, but it ends with the second associate saying aloud, "If that's what it scans it, it's right." I will credit the young lady who was helping me because I think she's smarter than the role she is in at her job. If she had been wearing a nametag, I'd call her out in person because she should be fast-tracked as a manager. Why? She didn't come back immediately to me, instead re-reading the sticker and flipping the book over once more to look at the cover price. She then went to another associate who was directing associates to return merchandise to its respective department and asked her. "Oh, that happens all the time, darling," the more experienced associate told my young friend. "Just override the price." Moments later, I have some money refunded and I walk out with the book into the cold winter air. I feel vindicated. I feel like I won this small battle. I open the door to the car, start the engine, and glance at the clock. It's right then and there that I realize that the mega-corporate department store technically won. For the $9 I saved, it was a pyrrhic victory in the end, much to my chagrin. I had spent over an hour in the store when it should have been an in-and-out in all of ten minutes. I'm worth more than $9 per hour, and I only ended up reading the first two chapters thanks to the repeated delays. Note to self: avoid that store at all costs in the future. It's an hour of my life I'll never get back.